Prince Mohammad Bin Fahd University pursues efforts to bring Prince Sultan College for the Visually Impaired (PSCVI) to reality. The PSCVI is intended to provide the best environment to help the visually impaired to overcome their impairment and integrate into the community. It aims to prepare and qualify the visually impaired to be self-sufficient and integrate into the community and fulfil their ambition in life. • provide learning and training opportunities for the visually impaired. • prepare the visually impaired College education and employability in the workplace. • Help the visually impaired acquire life skills to become self-confident and self-sufficient. The college fills in the huge deficit facing the Saudi society and the world in general in the provision of education and training services for visually impaired. To establish the College, PMU had partnered with two consultants for the project: The Royal National College for the Blind (RNCB) in Hereford, UK as the academic consultant and ZAS in Toronto, Canada as the Architectural Design Office. The RNCB being the academic consultant, has provided building specification and reviewed the designs accordingly. It also provided all the technical and infrastructure specifications for the PSCVI Content Conversion Center (CCC). The RNCB will also conduct a pilot training for the CCC prior to the start of operations in 2020. 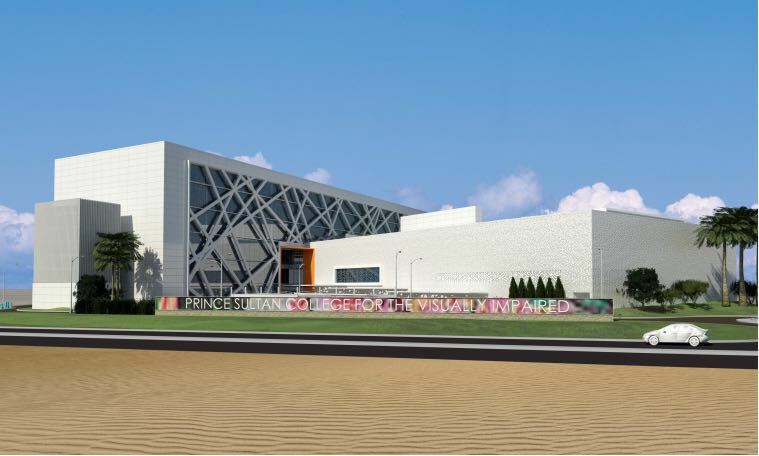 The designs being completed, PMU intends to start construction in September 2018 for the PSCVI to be operational and host its first cohort of students later in 2020.